You’ve made a list of all of the qualities you want in a parrot. You’ve gone on line and carefully researched the different species that fit your criteria. You’ve discussed the possibilities with the other members of the house. You’ve even checked out the costs of an appropriate cage and it’s accessories. You’ve decided, and you’re going to get the perfect parrot to fit your lifestyle!! But from where? There are really three possibilities: re-homing, breeder or pet store. I’m a little biased in my opinions about this one: I think that there are so many birds living in shelters that the obvious choice is to give a home to one that is needy. There are plenty of parrots out there who were given up during our economic downturn. Many people lost their jobs and homes and had to surrender their parrots to shelters. Many of them were not given up because of undesirable behaviors. The shelters are overrun and need homes for their birds. Seriously consider this as your source. A reputable, ethical breeder is my second choice on where to purchase a parrot. Aside from having husbandry skills that retailers typically don’t possess, they usually charge less. I would look for a small breeder, one that specializes in a single, or just a few, species of parrot. 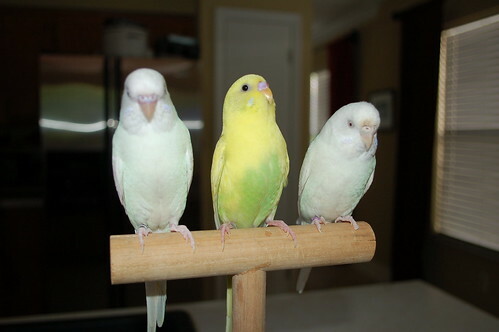 The best socialized birds will come from an active home that might include children and other pets. The breeder pairs (parents) should be on very healthy diets to produce good offspring and should be in clean, well kept environments. Breeders should not smoke around their birds. You will want your parrot to have been hand fed and well handled. Some breeders might teach the step up and harness train your parrot for you before bring it home. Your parrot should always be fully weaned before the breeder will even allow you to take it, and if that is not the case, beware. I strongly believe that a baby should be fledged and allowed to fly prior to the clip he might receive just before he leaves with you. I think this is essential to the good mental health of any parrot. This is a subject you will want discuss with the breeder, along with whether to clip the baby at all. 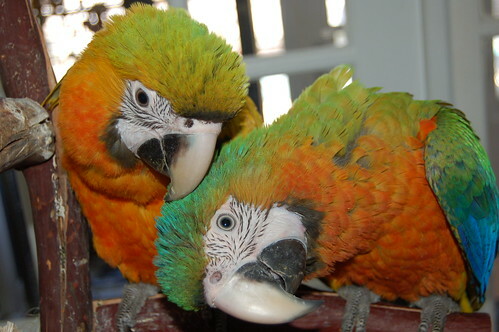 A good breeder will have extensive knowledge on the species you are interested in and will make himself available for advice after you’ve taken your parrot home. Before you buy, check past references, which any reputable breeder will offer willingly. Make sure you get a written health guarantee, and are given time to have an avian vet check your new parrot’s health before you are locked into the sale. Trust your instincts when you meet the breeder and make your choices based on what you see and feel. There are unethical breeders out there who, for instance, use related breeding pairs that might impact the future health of your new parrot, Never purchase from a puppy mill type breeder. Your chances of bringing home a healthy, socialized parrot are dubious at best. I find that pet stores fall into one of two categories: good and really bad. The good pet store is one where the birds environment is kept clean and food and water is fresh. They will be well socialized because of interaction with the store employees, who will not have them placed in an area of the store that is out of sight where a child or adult might cause them harm or torment them. I, personally, do not like it when a pet store leaves the birds in enclosures that allow people to pick them up as they please. I don’t believe that this is anything but stressful for the bird. A conscientious owner will protect them from potentially harmful interactions with the customers, and their germs. The store I use for my supplies keeps them in a closed bird room, with supervised visits, or on perches behind the counter. 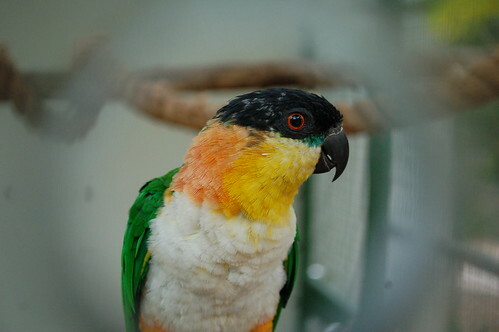 The large parrots are kept one to a cage (with toys), the smaller birds, no more than three to a cage. A really bad pet store will wrestle your new bird out of its filthy, overcrowded cage into a box and say: “$850 please.” You might say that this is a rescue. True, but you might also be getting a sickly bird, or one with abuse issues. Please never, ever patronize bad pet stores, no matter how hard it is to watch the animals suffering. The only way to stop them is to put them out of business, and the only way to do that is to NOT give them your money, and spread the word. As soon as you have “rescued” this one bird, another will simply take its place. I’m sorry to break it to you, but I don’t think that most people actually “made a list of all of the qualities you want in a parrot… gone on line and carefully researched the different species that fit your criteria… discussed the possibilities with the other members of the house.” If people did all the proper research before buying, there would be less abused and abandoned birds and there would be fewer people buying products from birdtricks to solve problems but instead would buy products to enrich their relationship with the bird. I could be wrong. Would be nice. hello chet & others, we are planning a new construction in a semi-desert climate. the house will incorporate extensive multi-level greenhouse areas, growing warm-weather plants (tropical to sub/marginally-tropical) and water features. I initially searched painted & Gouldian finches and smaller lovebird species, in other words little guys who might get along with the migratory hummingbirds & butterflies we hope will be pollinators for our gardens…. and in following one link after another, GAHHHH!!! I fell in love with Eclectus!!! HELP!! Help! Please convince me not to re-home a few breeding Eclectus pairs…. love, a bird-lover!